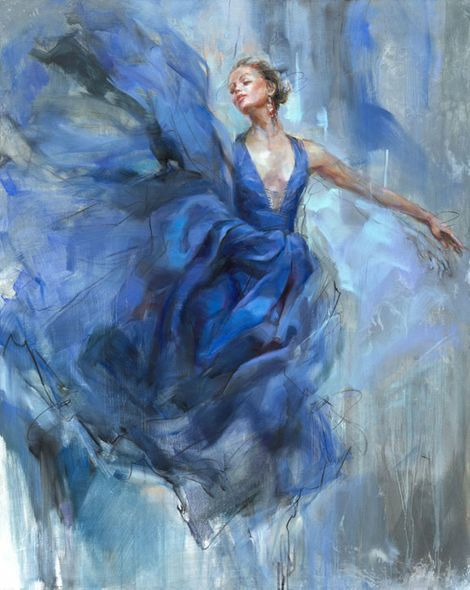 Anna Razumovskaya Hand Signed and Numbered Limited Edition Embellished Canvas Giclee:"Above"
Size : 18" x 24" - Select Additional Sizes from Drop Down Box. Edition Size : Artist Hand Signed and Numbered Limited Edition to 50. About the Artist:With her classic figurative forms, highly acclaimed Russian artist Anna Razumovskaya magically captures the lyrical romanticism of renaissance portraiture, while creating art that is completely modern and original. Anna is inspired by the graceful elegance of the female form, at turns, classically alluring, demure and provocative. Her art has a pervasive sense of �romanticism', and the passionate and dynamic application of paint on the canvas and the artist's signature use of expressive color, combine to create her uniquely recognizable style. Anna is a graduate of the Russian State University For Arts, where she was awarded the distinction of high-class artist in 1991. Subsequently, she studied art in Germany, Belgium and Holland. With solo exhibitions in New York, Paris, Toronto, Amsterdam, Antwerp and Berlin and numerous works in private collections across the globe, she has become one of the most exciting and collectable artists on the contemporary scene. Born at the height of the cold war, Anna was exposed to very different worlds, that of the austere communist regime alongside the sophistication and femininity of her fashion-conscious mother. She excelled at art school, and enjoyed the freedom of learning and perfecting her technique in a variety of different media. Of particular interest to her were the portrait masters of the late 19th Century, John Singer Sargent, the Russian painter Valentin Serov, and earlier masters such as Peter Paul Rubens and Rembrandt. She travelled around Europe absorbing the influences of artists past and present, and finally settled in Canada which she now feels to be her true home. "Quickly, easily, and brightly: this is the way I draw, the same way I live. My art is a reflection of my life, a reflection of myself�" - Anna R.